DJ’s and mobile entertainers need reliable protection for their uplighting investments when they’re traveling from gig to gig, and never is this more important that during the summer months, when high heat and humidity can wreak havoc on light fixtures. With more outdoor events happening in the summer months, including weddings and parties, the demand is even greater for affordable, lightweight yet strong and sturdy gear bags. Arriba Cases is meeting the demand with new bags designed exclusively to transport and protect some of the most popular LED uplighting fixtures – the AC 205 Uplighting Bag, the AC 210 LED Bar Bag and the AC 117 Flat Par Bag. Uplighting is one of the hottest trends in mobile entertainment lighting, and it’s seen everywhere these days, from weddings and corporate events to bars and nightclubs. The beautiful, color-saturated effects it provides can set the mood for any occasion, adding elegance and glamour to even the most casual affair. The long-wearing and resilient construction of Arriba Cases helps to ensure that all lighting fixtures – uplighting and otherwise – make it from gig to gig safely and securely and ready to dazzle the crowds. The new AC-205 Uplighting Bag is a protective padded soft-shell case designed exclusively for LED bars. It will hold two American DJ Mega Bar 50 RGB fixtures. 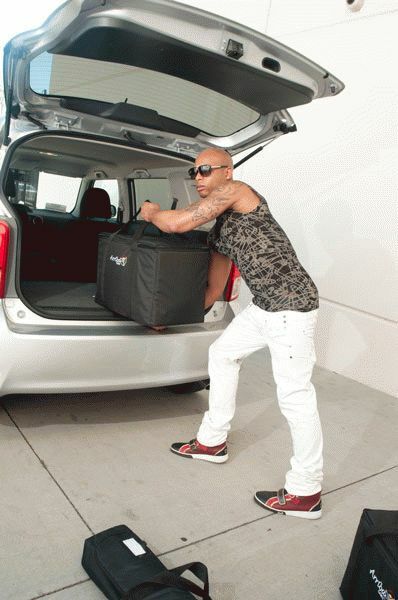 In addition to American DJ products, all Arriba Cases will hold similar-sized products from other manufacturers. All Arriba Cases are made with a durable yet attractive woven black nylon fabric outer shell and have strong nylon webbing straps. The interior features high-density foam-padding that conforms to and cradles the fixtures, keeping them secure during transport and protecting them from the bumps and knocks that come with life on the road. In cases designed to hold more than one fixture, an adjustable padded divider further customizes the fit, preventing the fixtures from knocking against each other while in the case. A favorite feature of Arriba Cases is the extra-wide zipper opening, which allows for quick removal of the gear from the case, making set up and tear down faster and easier from mobile entertainers and DJs. The low-profile design of Arriba Cases allows the fixtures to be easily and safely stacked, saving space in a van or the trunk of a car. The AC 205 Uplighting Bag, the AC 210 LED Bar Bag and the AC 117 Flat Par Bag also feature a secure “view window” on the top of the bag, perfect for placing a business card or fixture name for quick and easy identification. Arriba Cases are also great storage bags, as they keep fixtures secure and dust-free when not in use. 23” x 7” x 5” (584 x 178 x 127 mm); the AC-210, 44.75” x 6.75” x 4.75” (1336 x 171 x 121 mm); and the AC-117, 11.5” x 4” x 15.5” (292 x 102 x 392 mm). Arriba Cases are also designed to be “light” on mobile entertainers’ budgets – the prices of these three bags range from $34.95 to $56.95, a minimal investment for maximum protection.